This year we will honor Jim Heinze as the Alumni Fellow for Agriculture. The goal of the Alumni Fellows program is to create opportunities for successful alumni to interact with our students. 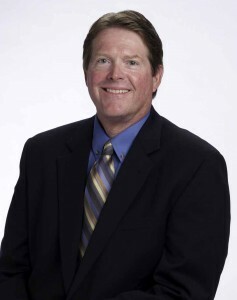 Jim Heinze is the Director of Sales, North America for the Commercial Division of The Toro Company. He serves on the management team contributing to business strategies for revenue growth, new products, and market development. He directs a team of sales professionals delivering innovative product solutions and exceptional customer service through the industries’ leading distribution channel. Upon graduating from K-State, Heinze managed a landscape business and Toro distributor in the K.C. area. An accomplished sales professional and industry contributor, Heinze served on the Heart of America GCSA and the Kansas Turfgrass Foundation board. He joined Toro in 1993, achieved positions of increasing responsibility, promotion to Director of Commercial Sales in 1999, and responsibility for North America in 2012. Heinze is from Lincoln, Kansas, earned his Bachelor of Science degree in Horticulture in 1977 and Certified Sales Executive certification in 2007. He is a contributing member to the K-State College of Agriculture Dean’s Advisory Council. Heinze and his wife D. Lynn (Wiedenmann) Heinze ’77 have three children and reside in Apple Valley, Mn. Congratulations Jim and “Thank You!” for everything you have done to give back to the KSU Turfgrass Program! 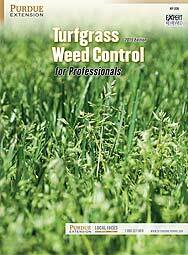 There is a great resource to all the turfgrass professionals out there. It is called “Turfgrass Weed Control for Professionals – 2015 Edition”. It was developed from Purdue University from some great turfgrass scientists. It is only 12 dollars for a print copy and you can download it in a PDF file for only 10. I highly suggest getting one for reference. This tree had pine wilt disease, and it was cut down and burned to reduce the risk of spread to other trees. In Kansas, new pine wilt infections are most visible from August to December. Trees wilt and die in a short period of time, from several weeks to a few months. In the first stages, the needles turn grey or green, then yellow and brown. The discoloration sometimes occurs branch by branch, sometimes all at once. With pine wilt, eventually the whole tree dies, within a few months. The brown needles stay on the tree for up to a year after the tree has died. Another key symptom is reduced resin. On a healthy tree, sticky resin bleeds from the site of a wound. In contrast, if a tree has pine wilt the resin is often reduced or absent, and branches become dry or brittle. 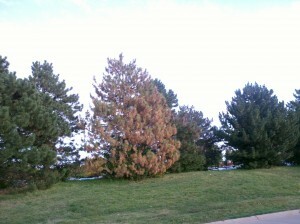 With the other diseases (tip blight, needle blight) only parts of the tree turn brown. With pine wilt, the whole tree is brown and dead. If you aren’t sure if your tree has pine wilt or something else, contact your local K-State Research and Extension Office or the K-State Diagnostic Lab (clinic@ksu.edu). If a tree has pine wilt, the tree should be cut down by April 1 to make sure there is time to destroy the wood by May 1, when the beetles start to some out. Cut the tree to the ground—don’t leave a stump. Chip or burn the wood immediately to destroy the beetles and nematodes. Don’t keep pine wood around for firewood. I’ll post information about some of the other pine problems soon. 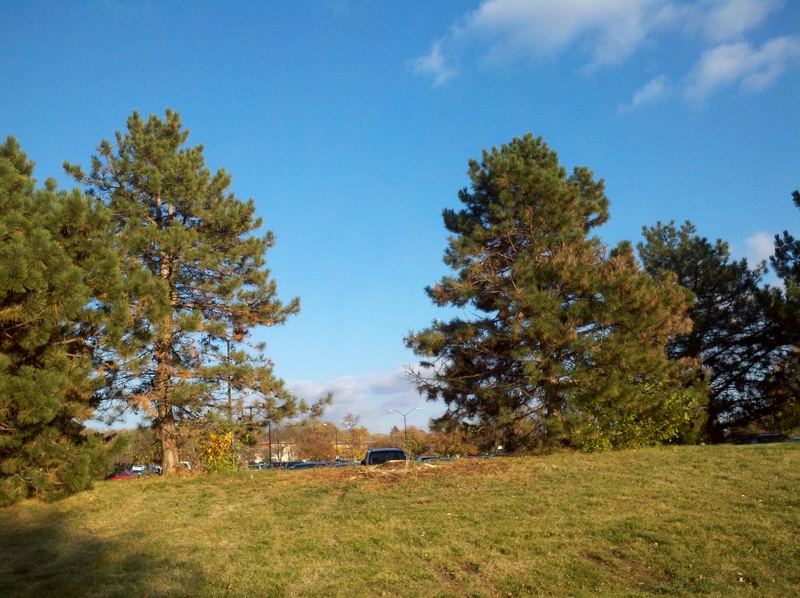 Are you pining for healthy pines?